We hear about it all the time: pedestrians being hit by cars while crossing the street in Hartford. According to 2015 and 2016 data collected by the Census American Community Surveys, Hartford ranks number eight among the top 10 cities in the United States with the highest number of households without access to cars. That means an average of 31.5 percent of households in the city must have other means of getting around – including walking in wintery conditions or at night. 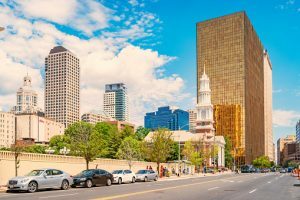 The good news is that in 2018, Hartford was the first city in Connecticut to be named “walk-friendly” due to its improved infrastructure, widened sidewalks, and adequate lighting. The bad news is that some sections of Hartford are not so pedestrian-friendly. One of those sections is the city’s North End, according to FOX61. Sparse crosswalks and mounds of snow on sidewalks make it difficult for pedestrians to stay out of harm’s way. The pedestrian risk in the area – where a pedestrian was killed in a hit-and-run in September – has spurred community members to take action. “Every day, when we come outside, we see all these problems and it’s not getting addressed,” a high school student and Road to Zero member said. In order to tackle the problem, the Center for Latino Progress – Cooperative Community Crash Reduction was awarded a grant from The National Safety Council. In a collaborative effort with the Blue Hills Civic Association, the group conducted a walking audit of North Main Street – led by Road to Zero coordinator Gannon Long. The audit raised several concerns regarding pedestrian safety in the area, including the lack of crosswalks, functional walk signals, well-maintained sidewalks, curb cuts, and protected bike lanes. In 2018, the group installed several neon yellow pedestrian signs in crosswalks throughout the city’s north end. The purpose is to alert drivers to slow down and be prepared to stop. At the Law Offices of Mark E. Salomone, we have seen the dangers pedestrians face every day in Hartford and throughout Connecticut. We have seen the devastation caused by negligent drivers: broken bones, serious head injuries, spinal injuries, and even fatal injuries. If you have sustained injuries or lost a loved one in a pedestrian accident, our legal team is here to help. Don’t think you can afford an attorney? There is no need to worry. We operate on a contingency fee basis, which means you don’t owe us any money unless we recover your medical expenses, lost wages, and losses associated with pain and suffering. Contact us today to schedule a free case evaluation. At the Law Offices of Mark E. Salomone and Morelli, we build powerful cases for our clients and have a reputation for turning over every possible stone in order to win them. Serving Connecticut, our dedicated, determined personal injury lawyers mean business and opposing counsel knows it. If you or a loved one has been involved in a motor vehicle accident in Hartford, New Haven, or Waterbury, a car and truck accident lawyer with our Connecticut firm will fight to help you obtain compensation you deserve. Attorney Joseph Morelli admitted in Connecticut only - Attorney Mark Salomone admitted in Massachusetts only.